The cavalry Companions were heavily armored horsemen who were armed with a spear and sword. In Alexanders campaignes there were 200-300 units of these horsemen and their were a handful of Royal Companions that were called agema. These units were a key factor in this war especially because they were a swift way of getting place to place, and also quick in battle despite the fact the men riding were armored. The Hypaspists were very effective in Alexanders battles because of their wide range of tactics. They could almost complete any task even though they were infantry. They acted as an aid to the phalanx by protecting the right flank and they were also good for skirmishing, and storming walls. They were even quick enough to aid the cavalry. The Greek hoplites are very different from the Macedonian hoplites. The Greek hoplites has an enourmous shield which was quite heavy only enabling them to carry a small pike or spear because the weight in both arms would be too much to bear. Knowing this King Philip made the shields of the hoplites smaller and now instead of being held the shields were slung over their left shoulders enableing them to carry a spear anywhere from 13-17 ft in both hands. Another adjustment Philip made was that he lengthened the phalanx to 16 rows of men instead of the Greek phalanx which had 8. The first five rows of men in the Macedoinian phalnx had their sarisa or spears pointing forward. The rest of the rows had their sarisa pointing to the sky. This provided a good defense against the enemy missiles. Alexander did not only bring his own men on his campaigns but he also employed many auxilary, or allied troops, and brought them too. Probably the most effective auxilary troops were the Thessalians, these people had the best horses and they were the best horsemen. The elite group of the Thessalian horsemen were called the Pharsalus Squadron, these men were the people who protected the ruler of Thessaly. The oxybeles was the most common form of seige craft that the King Philip had established. They had a missile engine that would hurl darts or large bolts at the enemy forces, ranging up to a quarter mile. Alexander's battle with the Scythians was the first place in his campaighns where the use of artillery was used. His train included siege ladders, battering-rams and siege towers, and many of his engines were built on the spot. 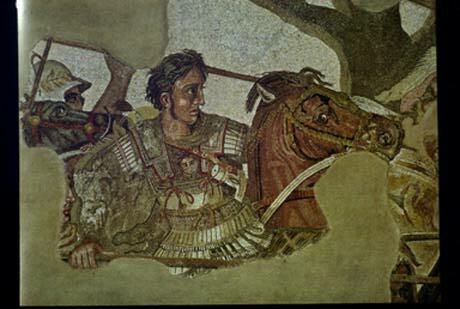 Alexander's chief engineer was Diades, and as u can see he must have been a large part in getting to Alexanders goal. Battle of Granicus - 334 B.C. Battle of Issus - 333 B.C. Battle of Gaugamela - 331 B.C. Battle of Hydaspes - 326 B.C. Battle of Sagalassus - 334 B.C. Battle of Gates - 330 B.C. Battle of Mice - Megalopolis 330 B.C. Battle of Baqae - 328 B.C. Battle of Aornus - 326 B.C. Battle of Sangala - 326 B.C.